The brand-new CoolForce 2 from Nanoxia impresses at first, thanks to its rugged steel exterior and weighty panels – it feels built to last. The three-step fan controller can power the three included 140mm fans, and at the bottom of the front panel, there’s a button that turns the two vertical green LED strips behind the front panel on and off. closing up the case awkward. On the plus side, there’s loads of room, with XL-ATX support equating to eight expansion slots. No standoffs are installed, but the PSU is properly isolated from the chassis. In fact, noise isolation is a strong point, with plenty of noise-dampening material fitted. Meanwhile, both 5.25in drive bays feature tool-free locks in their removable cage. At the front is a big vertical column with three dedicated 2.5in trays, each released with its own thumbscrew. A fourth tray is also included behind the motherboard tray, and Nanoxia helpfully includes right-angled and straight SATA data/power extension cables, as well as an 8-pin CPU power extension cable. Hidden from view behind this column you’ll also find a removable, two-bay 3.5in/2.5in drive cage on the floor, with antivibrations fitting. Bridging the gap between the SSD column and the motherboard tray is Nanoxia’s ModuWand, installed parallel to the front panel. While the ModuWand cuts GPU clearance to a still decent 300mm, it can be used for a wide variety of jobs. Firstly, it can accommodate two SSDs and two hard drives, although they need to be installed back to back. 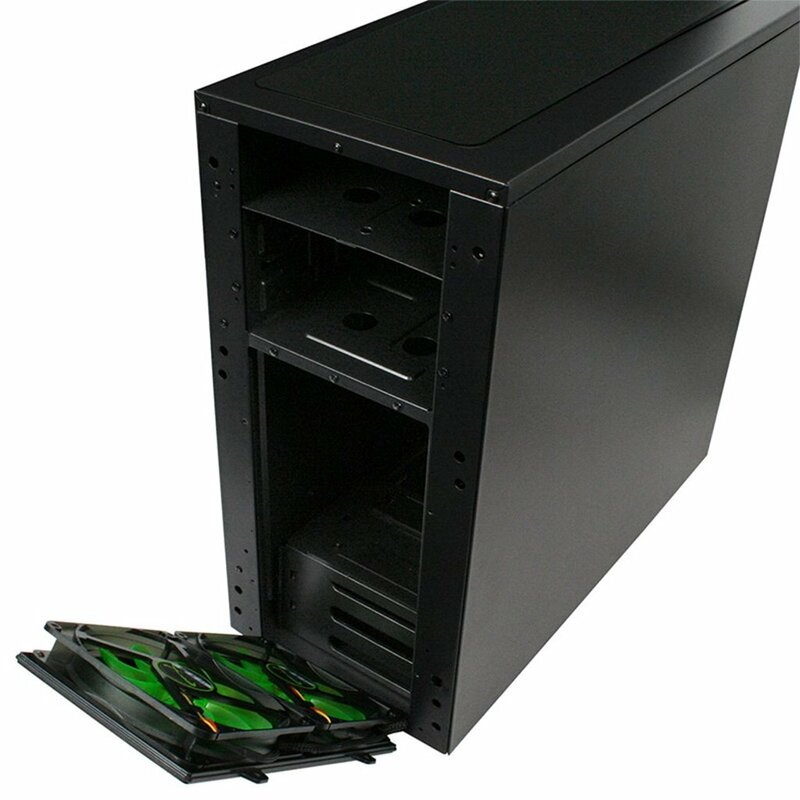 Alternatively, you can mount one or two fans on it – the CoolForce 2 has a whopping nine fan mounts in total, more than any other case on test. It’s also possible to install pumps and reservoirs here or, of course, you could just remove it. Cable routing is a mixed bag though – there are plenty of holes and rubber grommets, but nothing is pre-connected for you (such as the fan controller), and the Velcro cable ties aren’t anchored anywhere, which makes them hard to tighten effectively. On the plus side, the CoolForce 2’s watercooling support is very good – any thickness of 240mm radiator can be installed in the front, while up to 360mm radiators can be fitted in the roof. You should be able to fit a full-thickness radiator in the roof too, but you’ll likely need to use low-profile memory. In terms of airflow performance, at maximum fan speed, the GPU delta T is very good at 51°C (HD 5870), although the CPU delta T is fairly warm at 59°C (Core i7-870). However, removing the drive cage and ModuWand improves the CPU result by 2°C, while worsening the GPU result by the same amount. While the minimum speed result is a little too hot, the medium setting provides a good balance between noise and performance. The CoolForce 2 is a decent case with tonnes of features and some good ideas, such as the flexibility of the ModuWand. However, in a few places the user experience isn’t quite at the necessary level to compete with other cases in this league.